With just over two weeks until the torch is lit in Rio de Janeiro, Brazil, for the 2016 Summer Olympics, athletes from the Chicago area are gearing up to represent Team USA. Chicago, which historically ranks second in the U.S. for most Olympic-born athletes, will be sending 10 athletes to the games this year. Wrestler Daniel Dennis grew up in northwest suburban Ingleside and is representing the U.S. in the 57-kilogram (125.5 pounds) weight class. 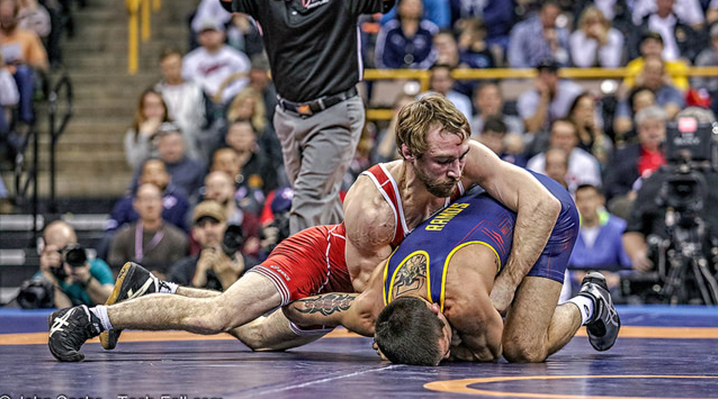 His career has been marked by ups and downs, both on and off the mat. As a student athlete at Grant Community High School, Dennis was a two-time state runner-up. "He was always pushing the limits – whether it was with Rollerblading, his motorcycle, or wrestling," said Ryan Geist, Dennis's high school wrestling coach at Grant. "He's the only athlete that I've had to kick out of the gym." Dennis went on to wrestle at the University of Iowa, where he finished second once again at the 2010 NCAA Championships. Terry Brands, associate head coach of wrestling at University of Iowa, says that the second-place finishes that came to define Dennis’s wrestling career eventually took a toll on his psyche. In 2013, while his father was battling terminal cancer, Dennis left wrestling and moved to California. For two years, he lived out of his pickup truck, disconnected from TV and the internet. Following his father’s death in 2014 and after briefly coaching a high school wrestling team, Dennis decided to return to the mat. In 2015, he placed second in the U.S. World Team Trials; one year later he was crowned U.S. Olympic Trials Champion. Brands said he always viewed Dennis’ wrestling hiatus as more of a “needed relief” than a complete retirement from the sport. Since high school, Geist has maintained a close friendship with Dennis. They often go on motorcycle rides together and Dennis frequently appears at Grant's wrestling camps. "When I coached him, he sort of became my son," said Geist, who will be travling to Rio de Janeiro to watch him compete. "Daniel has just as much a chance to win gold as anyone else." Other Chicago-area athletes who qualified for the 2016 Games include 16-year-old Libertyville native, Laura Zeng, and 19-year-old Northbrook native, Monica Rokhman. They are members of the six-person Rhythmic Gymnastics team, a ballet-like category of group gymnastics that incorporates hoops and ribbons. This will be the first team in 20 years representing the U.S. in the Olympics. Swimmer Conor Dwyer of Winnetka returns to the Olympics after winning the gold medal with the 4x200-meter freestyle relay team in 2012. He will be re-joining the relay team and will also compete individually in the 200-meter freestyle and the 400-meter freestyle. Swimmers Kevin Cordes (Naperville) and Olivia Smoglia (Glenview) are also headed to Rio de Janeiro. The 2016 Summer Olympics take place from Aug. 5-21. See a complete list of the 2016 U.S. Olympic Team. May 9: A new photography exhibit traces the history of the games and explores its 1896 revival.